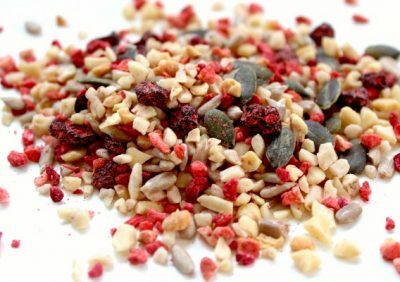 Our ProMixes are amazing mixes of chopped nuts with a sprinkle of seeds and some of the most extraordinary fruits in the world… Organic Persian Mulberries, Organic African Mango, Sun Dried Banana and even a touch of Belgian Chocolate! The nuts are chopped up into small bits to make them “pourable” – ideal to pour right into your ProMix refill tube (sold separately). Pour straight into your mouth as a healthy snack, sprinkle over porridge, mix with yogurt or add to your flapjacks or brownies! The best thing about ProMix is that you can take it with you wherever you’re going! Each refill pack is 750g, which will give you 25 x 30g portions. PS: Best to start off with the Sample Box of 10. There’s a selection of our top 10 ProMixes in each box, so you can start there and pick your favourite! INGREDIENTS: Chopped Cashews (Nuts), Chopped Californian Almonds (Nuts), Sunflower Seeds, Chopped Hazelnuts (Nuts), Organic Persian Mulberries (10.5%), Greek Zante Currants, Pumpkin Seeds, Sun Dried Goji Berries. INGREDIENTS: Chopped Cashews (Nuts), Chopped Californian Almonds (Nuts), Sunflower Seeds, Greek Zante Currants, Organic African Mango (11.8%), Chopped Argentinian Peanuts (25% Protein), Pumpkin Seeds, Chopped Hazelnuts (Nuts). INGREDIENTS: Chopped Roasted Hazelnuts (27%), Greek Zante Currants, Sunflower Seeds, 11.2% Dark Belgian Chocolate (51% Cocoa, Sugar, Soy Lecithin, Natural Vanilla), Pumpkin Seeds, Phoenix Dates, Chopped Cashew Nuts, Chopped Argentinian Peanuts (25% Protein), Coconut, Chopped Californian Almonds (Nuts), Fat-Reduced Cocoa (1.5%). INGREDIENTS: Chopped Argentinian Peanuts, Chopped Cashew Nuts, Sunflower Seeds, Greek Zante Currants, 8.6% Dark Belgian Chocolate (51% Cocoa, Sugar, Soy Lecithin, Natural Vanilla), Pumpkin Seeds, Chopped Californian Almonds (Nuts), Strawberries (3.8%), Raspberries. INGREDIENTS: Chopped Californian Almonds (Nuts), Chopped Cashews (Nuts), Sunflower Seeds, Chopped Argentinian Peanuts (25% Protein), Chopped Hazelnuts (Nuts), Organic Persian Mulberries (11.5%), Greek Zante Currants, Dark Belgian Chocolate (8.3%)(51% Cocoa, Sugar, Soy Lecithin, Natural Vanilla), Pumpkin Seeds. INGREDIENTS: Chopped Californian Almonds (Nuts), Chopped Cashews (Nuts), Sun Dried Banana 14.3%, Chopped Hazelnuts (Nuts), Sunflower Seeds, Dark Belgian Chocolate (8.3%)(51% Cocoa, Sugar, Soy Lecithin, Natural Vanilla), Pumpkin Seeds, Coconut, Rice Flour. INGREDIENTS: Chopped Argentinian Peanuts (25% Protein), Sunflower Seeds, Chopped Cashews (Nuts), Chopped Californian Almonds (Nuts), Greek Zante Currants, Pumpkin Seeds, Strawberries (6.6%), Raspberries (2.2%). INGREDIENTS: Roasted Peanuts, Cherry Flavoured Raisins (Raisins, Natural Flavour, Citric Acid), Chopped Cashew Nuts, Sunflower Seeds, Cranberries (Cranberries, Pineapple Syrup, Sunflower Oil), Currants, Pumpkin Seed Kernels, Cherries, Raspberries, Chopped Californian Almonds (Nuts), Cinnamon. INGREDIENTS: Chopped Roast Peanuts (32.3%), Greek Zante Currants, Sunflower Seeds, 11.2% Dark Belgian Chocolate (51% Cocoa, Sugar, Soy Lecithin, Natural Vanilla), Pumpkin Seeds, Phoenix Dates, Chopped ashew Nuts, Coconut, Chopped Californian Almonds (Nuts), Fat-Reduced Cocoa (1.5%), Natural Flavouring. INGREDIENTS: Sunflower Seeds, Chopped Cashew Nuts, Chopped Argentinian Peanuts, Chopped Californian Almonds (Nuts), Chopped Hazelnuts, Dark Belgian Chocolate (8.3%)(51% Cocoa, Sugar, Soy Lecithin, Natural Vanilla), Cherry (7.5%), Pumpkin Seeds, Greek Zante Currants. INGREDIENTS: Chopped Roasted Peanuts, Sunflower Seeds, Coconut, Chopped Californian Almonds (Nuts), Chopped Cashew Nuts, Pumpkin Seeds, Chopped Hazelnuts, Tamari Sauce (Soya Beans, Sea Salt, Koji (Aspergillus Oryzae)), Crushed Chillis, Smoked Paprika, Chilli Powder. Allergens: See highlighted ingredients above. Note that even if not listed, ALL our ProMixes may contain traces of peanut, soya, sesame & other nuts not listed above. ProMixes with chocolate chips may contain traces of milk. Store our ProMixes in a cool, dry place away from direct sunlight. INGREDIENTS: Roasted Hazelnuts (27%), Greek Zante Currants, Sunflower Seeds, 11.2% Dark Belgian Chocolate (51% Cocoa, Sugar, Soy Lecithin, Natural Vanilla), Pumpkin Seeds, Phoenix Dates, Cashew Nuts, Argentinian Peanuts (25% Protein), Coconut, Californian Almonds (Nuts), Fat-Reduced Cocoa (1.5%). INGREDIENTS: Argentinian Peanuts, Cashew Nuts, Sunflower Seeds, Greek Zante Currants, 8.6% Dark Belgian Chocolate (51% Cocoa, Sugar, Soy Lecithin, Natural Vanilla), Pumpkin Seeds, Californian Almonds (Nuts), Strawberries (3.8%), Raspberries. INGREDIENTS: Chopped Californian Almonds (Nuts), Chopped Cashews (Nuts), Dun Dried Banana 14.3%, Chopped Hazelnuts (Nuts), Sunflower Seeds, Dark Belgian Chocolate (8.3%)(51% Cocoa, Sugar, Soy Lecithin, Natural Vanilla), Pumpkin Seeds, Coconut, Rice Flour. INGREDIENTS: Roasted Peanuts, Passionfruit Flavoured Raisins (Raisins, Natural Flavour, Citric Acid), Sunflower Seed Kernels, Mango, Banana, Chopped Cashew Nuts, Pumpkin Seed Kernels, Chopped Californian Almonds (Nuts), Coconut, Currants, Apple, Freeze Dried Raspberries. INGREDIENTS: Chopped Cashew Nuts, Sunflower Seeds, Chopped Californian Almonds (Nuts), Toasted Chopped Pecan Nuts (15%), Coconut, Pumpkin Seeds, Cinnamon & Ginger. INGREDIENTS: Sunflower Seeds, Cashew Nuts, Argentinian Peanuts, Californian Almonds (Nuts), Hazelnuts, Dark Belgian Chocolate (8.3%)(51% Cocoa, Sugar, Soy Lecithin, Natural Vanilla), Cherry (7.5%), Pumpkin Seeds, Greek Zante Currants. INGREDIENTS: Roast Peanuts (32.3%), Greek Zante Currants, Sunflower Seeds, 11.2% Dark Belgian Chocolate (51% Cocoa, Sugar, Soy Lecithin, Natural Vanilla), Pumpkin Seeds, Phoenix Dates, Cashew Nuts, Coconut, Californian Almonds (Nuts), Fat-Reduced Cocoa (1.5%), Natural Flavouring. Allergens: See highlighted ingredients above. Note that even if not listed, ALL our ProMixes may contain traces of peanut, soya, sesame & other nuts not listed above. ProMixes that have chocolate chips may contain traces of milk.